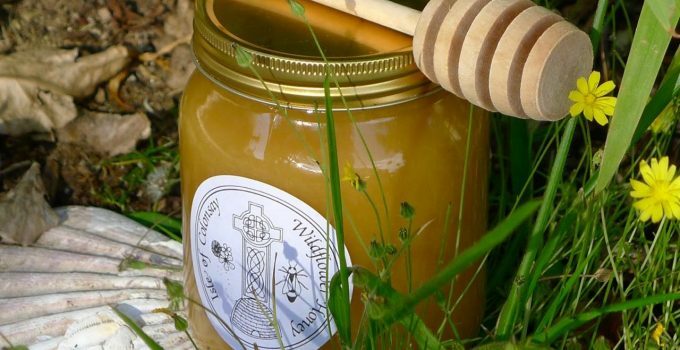 Isle of Colonsay Wildflower Honey is unique, not only because of its taste, but also because of its provenance: the small windswept island is the last place where the Native Scottish Black Bee can be found, which has also boarded the Ark of Taste. In past centuries there were Native Black Bees all across Scotland, but the isles of Colonsay and Oronsay are some of the last remaining havens, protected with reserve status by the Scottish Government to retain their biodiversity and prevent cross-breeding. Deeply aromatic, with a powerful flavour, Isle of Colonsay Wildflower Honey varies naturally according to the foraging and seasons, but always reflects the unmistakable terroir of this remote isle, with a combination of nectar from thousands of Hebridean wildflowers. Heathery notes are quite strong, and in season, wild thyme can be detected. Industrial farming interferes with natural bee foraging—where hedges are uprooted and grasslands artificially fertilised by nitrogen instead of nature’s clover. Only in such remote places as Colonsay can a wide diversity of wildflowers still be found. The honey is extracted and filtered at the lowest possible temperature to preserve the essential oils and their unique flavours.